Nicely made with large quilted areas so the loft can stay high. I think this is the perfect weight so you're not too hot under it, but it's still very cozy. For indulgent comfort and luxury, this down alternative comforter features a 230 thread count shell, a box stitch construction to prevent shifting, and filling made from hypoallergenic polyester. The plush cotton exterior pairs with the thick filling to deliver exceptional coziness and warmth, even on the coldest nights. For your convenience, the comforter is machine washable and available in three sizes to ensure you can find the one that is right for your bed. This is my first down or down alternative comforter, and I've had it about a week now. My husband and I decided we needed something more cozy than our previous comforter, and we decided we each needed our own comforter so we quit disturbing each other when we roll over at night. We have a king size bed, we are tall (5'10" and 6'4") and we have dogs that we like to cuddle with while we read, so I wanted something big enough for us and our bed and something we could wash. So here is my evaluation of this comforter: Pros: 1. It is puffy. Puffier even than the picture. I love it! 2. It is warm. Our house has been around 63 degrees lately (our thermostat is being worked on) and these comforters have been our salvation! 3. It is cozy. It's the kind of comforter that is so thick and cozy that when you lay on top of it you sink into it, and when you're under it, you can sort of burrow in. Our first night using this comforter, my husband said that the cozy factor of our bed increased like 5 times! 4. It is quality. It's not going to fall apart, and given a good cover and normal usage, should last a very long time. It fits in a regular size duvet cover. I was worried that I would have to spend a lot of money to get a cover big enough to handle this comforter. Not so. And that's actually the first con... Cons: 1. It is not as big as the website or the tag on the comforter says. I measured ours and they are 76" wide by 81" long. My guess is that the fabric for the top piece before the stuffing is put in is probably 90" by 88;" then they add the stuffing and it suddenly becomes much smaller. However, it does mean that this comforter fits in a regular sized duvet cover, and we have found that our two queen size comforters are long enough to cover us comfortably, and they cover our king bed nicely. 2. It is loud. It's true. It rustles a lot. We think it sounds cozy, but I can certainly see how it would bother a light sleeper. It sounds quite like an old waterproof sleeping bag does. But again, we think it adds to the cozy factor. 3. It is warm. We live in an area where temps range from 20 below to 110 each year (yeah, I know... what are we thinking!). Last night my husband expressed his concern that this comforter will be too hot in the summers. An easy fix for us - I'll just take the comforter out of the duvet cover, and we'll use the duvet cover by itself (we don't have AC... again, what are we thinking!). We love the comforters we bought, but I read many of the reviews and was concerned about what might be coming. However, I was prepared to deal with the noise, and I had regular size duvet covers waiting at the house to try out the size of this comforter. If you order it, just be ready for these things - if they'll bother you, don't order it! If you think you can live with those quirks of this comforter, I hope you do order it. We love this comforter, and if there was a way to put 6 stars up for comfort and value, I would have. It's really wonderful and just what we were looking for at a price we could afford! I researched a lot before purchasing this king size down-alternative comforter. It is thick and very warm, which is what we wanted. In the winter our home is around 60 degrees. I found that even with the larger squares, the filling is evenly dispersed - a very good thing. The 104x89 measurement fits our king size (with a 15-inch pillow-top mattress) bed nicely with around 11 inches hanging over the sides and 14 inches at the end of the bed. I didn't notice any annoying noisiness. The comforter is washable in a large capacity washing machine. I am VERY pleased. This is a terrific value. It has a soft, cozy feel and holds its shape well. It also has that nice "down" duvet weight to it though it's light enough to move around. You'd never guess it didn't cost much much more. We bought the king for our bed because we got the twin for my son and liked it so much. We actually upgraded him to a full size bed but still use his twin duvet. It doesn't hang down the sides but lays perfectly on top. And he couldn't bear to part with it! I've had my comforter three days now and my husband and I love it. My children love to snuggle in it too. It feels very soft like a down comforter and gives our bed a poofy look. I bought it to replace the queen down comforter that was worn out and given away a while ago. Now that winter is here, I needed something warmer than a quilt which we have been using during the warmer months. I didn't want to get another down comforter because of price and I didn't want feathers coming out. I got the king size and it fits our queen bed very nicely with about 20 inch overhang on each side of the bed if you place the longer side sideways. The comforter is actually 102 inches by 86 inches which perfectly fits a king duvet cover that I already have. Finally, I have a comforter that doesn't slide around inside the duvet cover, unlike my previous down comforter. The comforter appears to be well made. The stitching and piping around it looks tight. It is heavy enough that it doesn't slide around our bed (unlike the quilt) but not too heavy that it gets hot. We don't have to keep the heater on all night and I don't wake up in the middle of the night because I'm cold. It is so cozy and comfortable inside that I hate to get out of bed in the morning. To help make it last longer, I plan to purchase another duvet cover to use interchangeably with my present one so I can just change the cover instead of having to wash the comforter. But I like the fact that I can just wash the comforter if I have to instead of having to bring it to the dry cleaner. Also, even though the shell is only 250 thread count, it feels thicker and using a cotton duvet cover of 400 count or higher will make it feel softer. I ordered the twin size. It was supposed to measure 63x86" but the actual size out of the box is 62x81. I measured it three times to make sure I was measuring correctly. When I put it on the bed it came just to the bottom of the mattress. I'm not sure if it would shrink more if it was washed. Other than that it looks like a nice comforter. Too bad it's 5 inches too short. this is EXACTLY what I was looking for. Down-alternative comforters have become so flat -- almost like quilts/coverlets instead of fluffy, lofty covers. I WANTED a fluffy, crinkly comforter, not a limp one. Size: we got the King sized for our Queen bed, which has a 2 inch foam topper plus a very thick mattress pad. Usually Queen comforters barely cover the top and don't hang off enough to cover the mattress/box spring gap. This one comes down just long enough without looking silly or inappropriate. Looks like it was made for it. I suggest you measure your mattress before choosing a size. If you have a queen bed, always be careful of "Full/Queen" sizes, they tend to favor the Full size, NOT the Queen. Unlike the very very soft, flat Nanotex comforter also from Overstock -- with higher thread count -- this 230 one is fluffy, lofty...has 10 more ounces of "fill" than that one. This one will not slide off the bed and is the perfect weight for west Texas, where our winter lasts about 4 days -- but a/c is nearly year-round and this will be perfect for both extremes! I enjoy the soft crinkly sound, and I've had much noiser comforters than this one. This has a light crinkle sound and it just sounds soothing to me. It is not dull off-white to my eyes like some plain comforters, it is bright white, looks great all by itself. We won't be using it inside a duvet cover, just adding some colorful pillows. The outside covering is crisper than the well-worn-seeming types that some prefer, but this one is hardly like burlap! It's very satisfying and comfy like a cloud, won't mash down on your toes. This is the best, fluffliest non-down comforter I've ever had. Better than the feather ones, in my opinion. I have to use poly or cotton because of being allergic to down, and this is the right choice!! For those who use air conditioning a lot or have mild winters, this will probably do you just fine year-round. This all-season 230 thread count down alternative comforter is warm and is a perfect size for a queen size bed. The quality is very nice. 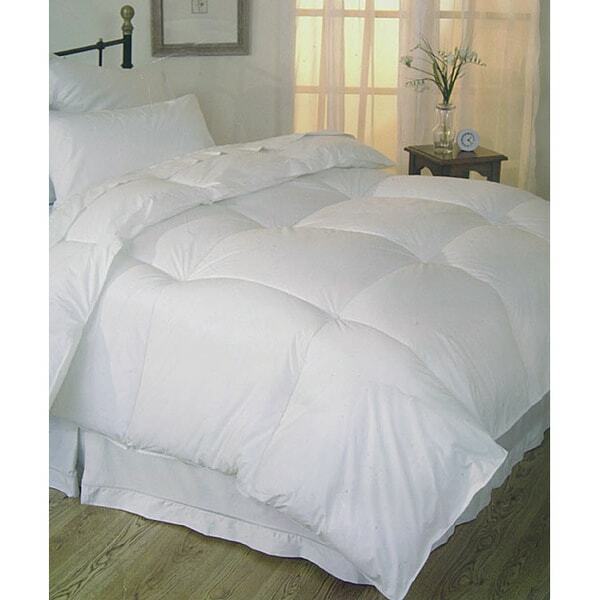 I am thrilled with my purchase of this comforter, my first on Overstock.com. As with others who go through the reviews, I was a little nervous from the few complaints. Here's my opinion to put some of you at ease. First of all, I've used duvets for some twenty years, so had an idea of what to expect in mind. Granted, those were down. In comparison, this comforter had sufficient loft; a good distrbution of fill; and a really nice bound edge (which some of my previous - and more expensive ones - did not). I've loved snuggling under it. There is, indeed, a muffled noise when moved. I'd compare it to that of a fluffy pillow or crisp sheets, though, not plastic bags (and I'd say a down comforter makes a similar noise, too). Also, I did order a size up - a king for my queen-sized bed - which covers it well. Finally, I always - even living abroad - have used a duvet cover. It protects the duvet, leading to fewer washes (and trust me, it's a lot easier to simply wash the duvet), and does tend to be softer. Besides, in respect to decorating you can switch things up as the mood strikes, instead of having to replace the entire thing. Just sewing two sheets together can give you an entirely new look, if you're so inclined. Anyway, again, a very good experience for me. I'm glad I went ahead with this purchase. Perfect for duvet! Excellent color. I previously had a name brand down comforter and loved it but the feathers started coming out of it and I felt like it was irritating my allergies more so I sold the down and started looking for a down alternative comforter. I read many reviews for comforters and the high rating on an item with many reviews on this comforter caught my attention. The price was pretty awesome too as I was really hoping to spend not more than $75 on a new comforter. After reading many other reviews I was prepared for a loud, puffy comforter. It came delivered in a box and someone else mentioned don't cut deep into the box as the comforter completely fills the box and you will cut it and they are CORRECT so beware if you buy this comforter to open it gently. Luckily, I took their advice and my comforter was fine. The comforter was very puffy coming out of the box. I ordered a King size and when I took it out of the box I was a little concerned that it wasn't big enough (we have a queen size bed and I wanted a little overhang). I have almost always purchased a size larger than that bed I have when it comes to comforters and blankets. I had a King size duvet from **** that this thing needed to fill so I put the comforter into the duvet with the tag at the bottom and the comforter was smaller width wise than the duvet, so then i tried the blanket and put it into the duvet with the tag to the side (I hope everyone knows what I mean by that) and after clipping it into the duvet with duvet clips and buttoning up the bottom of the duvet the comforter fit the duvet PERFECTLY!!! I honestly could not ask for a better fitting comforter for this duvet. When someone mentioned it's like sleeping on a cloud that is precisely what my boyfriend said about this blanket. It has alot of loft to it and a bit of weight. I think he described it as like being in a straight jacket made of clouds cause it's fluffy but the weight of it makes you fit snuggly under it. So far, the temperatures have been down in the single digits with wind chill and it keeps us PLENTY warm. The heater in our room isn't working right now in our apartment and in the past couple of weeks it has been so cold in our room but as soon as we get under this comforter and the sheets warm up this blanket has been amazingly warm. I do tend to get a little hot at night even on the super cold evenings (I typically use a fan when my bf is okay with it) so when I get a little too warm I just kick part of the cover off until I cool off and then cuddle back up with it. It is a little noisy when moving in comparison to my last comforter but I don't mind it one bit. I honestly believe that this comforter is exactly what people are looking for in a down alternative comforter. Between the price, warmth, and the general look of this blanket I think it is absolutely worth every single penny and then some. By the summer time I think this blanket might be a little warm to use but I will definitely try it as I know down comforters have the ability to keep you warm in the cold and cool in the heat so I will give it a try. Even if I have to save this just for the winter, the price of this blanket still makes it affordable to get a thinner blanket. I admit to being ignorant about the comforter/duvet 'thing'. I stay with a friend in Europe who uses only them and they're great in summer or winter and it's so much easier to change a duvet than to wash a comforter all the time. I talked to a local friend who directed me to Overstock and this particular product. I was NOT sorry and I intend to buy more. When the friend came to visit ME this time, he was pleased with my choice (as am I). This product washes great and Overstock has such a great collection of duvets to go with it. This is a great deal! I was impressed with the fact that it fits well on our king size bed, with enough on each side. So many don't cover well, but this one does. I would recommend to anyone! This is my first purchase from Overstock.com and I most certainly will keep coming back. Kudos! I purchased two king sizes. One for my queen bed and the other for my sister's king bed. I'm glad I went up a size! Still though, the comforter still doesn't cover my queen bed like it should. Very thick and soft. Couldn't hardly get it out of the box! Ordered on late Saturday afternoon and received it by Tuesday morning! Super fast delivery. Overall, I love my comforter and would recommend this especially for the price. My sister would do the same. Again her comforter is a little small on her king but she is making due because it is so comfortable. She and I both have severe allergies and this does not bother us at all!!!! For 50 bucks I was hoping to get a cozy comforter, but wasn't expecting the highest quality out there. When it arrived I was blown away by how warm and comfortable this is! I strongly believe the $220.00 retail comparison is no exaggeration for this comforter. I could easily see it selling in a department or home store for that much. The baffle boxes all have even distribution of filling, it's a great weight without being too heavy, and is very cozy, yet breathes. Even the fabric on the outside is high quality.Also, it took four years and three tries, but I FINALLY found a comforter to fill out my queen sized high-end duvet cover! I am very impressed with this product and am extrememly pleased with the purchase! I guess you get what you paid for.. I bought this conforter for my girlfriend and she absolutely loves it. She can't stop telling how beautiful and comfortable it is. Highly recommended. I can?t believe so many people were happy with this comforter. It?s fluffy enough but the material is rough and scratchy! Not worth it! Go for a higher thread count! Nice quality comforter for the price. I simply love this comforter. I purchase one over 10 years ago and it had gone flat and was worn out so it was very easy to look up the purchase and buy the replacement. I did try to get my kids the same one because mine is out 300 days of the year. However, the twin size did not work out as they are not wide enough. My new purchase makes me smile when I walk into my room. It is fluffy and I love how bright it is, very comfortable. I think I now go to bed early just to read because I want to enjoy how it makes me feel. I would purchase this again. Been using this comforter for 5 years, and has kept its shape and comfort incredibly well! Plan to use it for another 5 years. This is an awesome comforter. We have been using it with various duvets for awhile now & it still feels as fluffy as when it was new. It has kept us toasty warm during some really cold Minnesota winters! Perfect for allergy sufferers. Cool and comfortable. Super fluffy, and exactly what I needed. I really wanted a comforter I could sink into and I got it with this piece. The only issue I have with the comforter is that it can get a little too warm at times. "How many ounces of fill does the queen size of this comforter have?" "Hi. It seems most use this with a duvet. I like the look of the comforter as it is. Can it be used without a duvet?" Yes, I used it without a duvet and it was great. I'd say the only reason you would need/want to use a duvet cover is for washing sake, or if you want a higher thread count on the outside. "Has the sizing issue with the King sized comforter been fixed? Everyone is saying it is too small and is not the same measurements as listed. Very interested to purchase but quite concerned it will be too small for my king bed." Hi, I have a queen size bed and purchased this for my king duvet. I like having it hang long on the sides but this duvet only slightly hangs at the edge of my queen bed. It is very fluffy, soft and cozy but if you are looking for a true king size this is not it. I ended up ordering a super king down from another place to fill my king duvet but kept this one because I do still like it. "Does this product come with ties to hold the duvet cover in place?" No, it does not come with ties. Hope. It's functional, but not what I would rate as a "high end" item. "Is this comforter called HydroSense by Pacific Coast?" Unfortunately, we are unable to disclose the manufacturer of some of our products. I apologize for the inconvenience. "If I order this king size alternative down blanket, will it fit nicely in a king size duvet cover or should i get a queen size duvet cover for it?" The king comforter should fit in a king duvet cover. "Does the filling move around, i.e. towards the edges, leaving the middle mostly empty, the way down does?" The box stitching on this comforter should keep the filling from moving toward the edges. This product is not yet released, and is expected to ship on Feb. 17, 2006.